India’s National telecom backbone Bharat Sanchar Nigam Ltd (BSNL) has introduced a new GSM mobile phone top-up service that allows its customers to instantly top up mobile phones of family and friends in their from anywhere in the World, following a partnership agreement with Ezetop, the world’s largest company specializing in online mobile phone top-up services. 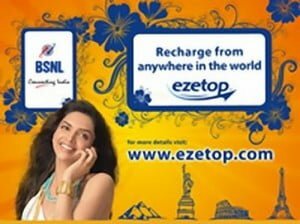 With the “ezetop” mobile recharge system any one can recharge, Gift a Top-up or add balance to any preapid BSNL mobile numbers via https://www.ezetop.com/. In this service, the top-up goes straight to the phone and can be used right away by whoever receives it. Ezetop is the largest and fastest growing international group focused on international and online mobile phone top up. Headquartered in Dublin, Ireland, with offices in Miami and Dubai, Ezetop leads the global top-up space, and has been at the forefront of this sector since its inception. Well there are 2 types of CDMA cards currently offered by BSNL – CDMA 1X & EVDO. It is recommended to go for EVDO provided EVDO enabled towers are avaialable in the locality in which you’ll use.With EVDO one can get practically upto 600kbps speed.CDMA 1X is only marginally better than GPRS.Also where no EVDO towers are available, you can operate the card in CDMA 1X mode. With 3G data card you can get upto 2Mbps speed. BSNL should have checked this before entering into agreement. PSU it self making see people distorted India Map.